There are several phenomena that point to people being in contact across parts of Europe, even in the late Neolithic Period. What date might that be? Well, it will vary according to where you look. It might be the 4000s BCE or it might be the 2000s BCE when a particular Neolithic community encountered its first metal. Neolithic technology was based round stone, basketry, shell, wood. Somehow people in the Balkan and Black Sea area discovered quite early on how to smelt copper metal from its ores. But this remained a piece of luxurious magic, owned and used by few, and copper smelting spread only slowly across the rest of Europe. 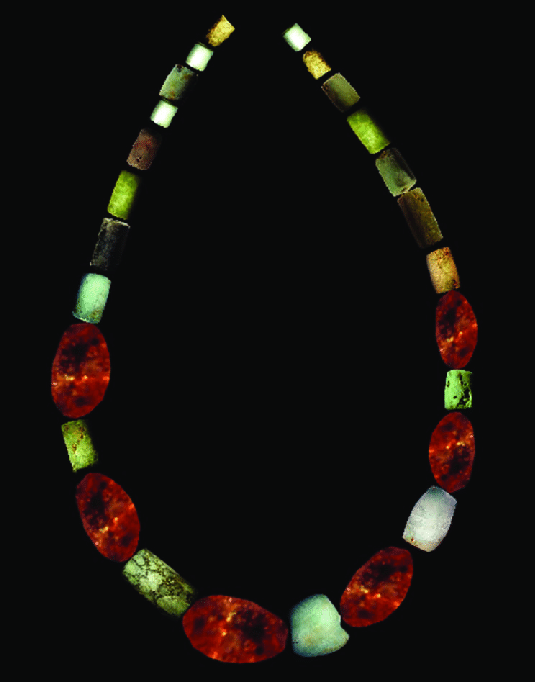 Neolithic necklace of amber and variscite from the Chousa Nova dolmen, Galicia, NW Spain (reconstruction). (see DomínguezBella & Bóveda, 2011).